As we enter that somber post-holiday period and begin our trudge through the shortest days of the year up here in the northern hemisphere, long periods of darkness are a fact of life, like it or not. Admittedly, I have never been a big fan of darkness myself and have long been sensitive to its sometimes depressing effects. When I was young, I was occasionally a victim of the scary “night frights” that many children can experience when alone in a darkened room. Although I have, for the most part, long outgrown that early phobia, even now I still feel from time to time a strange sense of dread when I wake up from an uneasy sleep to a blackened environment and wonder if I might suddenly hear that inexplicable “bump in the night” that will send me edging ever closer to my peacefully snoozing wife for comfort. It is interesting to note that many adults share the same kind of uneasiness when confronted with darkness in the color of a beer. Through the years, I have encountered many folks who shy away from any brew that is not endowed with the pale straw golden color that most of us associate with light-bodied pilsner-type beers, those that comprise the vast majority of the beers sold in America and elsewhere. Often, the reluctance to drink or even try such a brew is explained away by saying that the beer must be “too strong” as might be the case with double bock beers, or “too roasty” as is commonly a flavor feature in many stouts. Light is comforting, and so many will retreat to the reassuring familiarity of their pale lagers and forget the dark stuff entirely. What a shame! It may be a surprise to some to learn that just because a beer is dark in color, it is not necessarily higher in alcohol or excessively roasty in its flavor. Long ago, the Germans perfected a style of beer that beautifully reveals the flavors of darker malts while keeping the brew unexpectedly quaffable and eminently sessionable. That style, frequently overlooked by many American beer drinkers, is the black lager, or “schwarzbier,” of Bavaria. 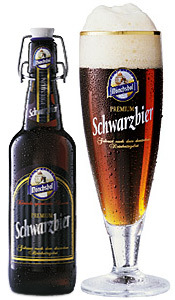 Schwarzbiers are often referred to as “black pilsners” because of their easy drinkability and milder flavors that may remind some of their lighter lager counterparts. Unlike the stronger bock beers, they are usually of a conventional strength in the neighborhood of five percent alcohol by volume. Although their flavor profile is certainly more robust than that of a traditional light pilsner beer, they generally feature a more restrained roastiness than that found in some other dark beers that could cause more timid drinkers to look elsewhere for their libations. was actually brewed by monks. Indeed, the five liter mini-kegs which in which the beer is frequently made available features a picture of a merry monk pouring himself a large tankard of the brew. For this reason I often affectionately refer to the beer as “Drunk Monk.” It recalls very fond memories of swilling Mönchshof with my brother Stuart as a way of celebrating past Superbowl victories by the New York Football Giants. Brewed to an alcoholic strength of a modest 4.9% by volume, Mönchshof features a mild yet deliciously complex roastiness that provides hints of both mocha and chocolate. Its subtle dry maltiness is complimented by a spicy but subdued hoppiness that is not overdone. It is the perfect accompaniment to roast beef or prime rib, and is mild enough to be able to enjoy a few more mugs after the meal is over without becoming inebriated. On this side of the Atlantic, schwarzbiers are admittedly a rare breed and can be difficult to find among American brewers. Fortunately, the Boston Beer Company, makers of the Samuel Adams line of fine craft brews, decided to stake its own claim to the style with its recent introduction of Samuel Adams Black Lager. This mildly robust brew is fermented to a similar conventional alcoholic strength, and features a smooth creamy maltiness that is firm but not overly sweet, with a gentle roastiness that entertains the taste buds without saturating them. My wife Nancy, who has a disdain for overly assertive dark beers, found this beer to make for some remarkably pleasant drinking and ended up soon reaching for a second. Naturally, I had to stay her hand so as to save more for myself. One would never expect to find a credible example of a German beer style like schwarzbier in a place like South America, yet in this case truth is stranger (and tastier) than fiction. A lovely and interesting interpretation of the black lager style can be found in the Xingu Black Beer of Toledo, Brazil. Although the brewer of Xingu claims to trace the beer's heritage to an ancient dark beer-like beverage made by Amazonian peoples from manioc root and roasted corn, it is today brewed as an all-malt beer that is not dissimilar to the schwarzbiers of Germany. 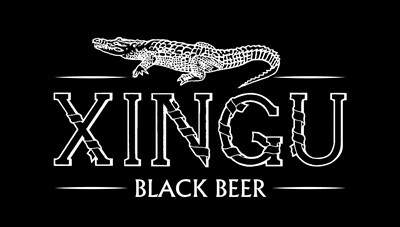 At five percent alcohol by volume, Xingu sports the familiar smooth and moderately dry malt characteristics you would expect to find in traditional black lagers, with coffee notes and perhaps even a faint hint of licorice. Although I was admittedly skeptical of this product when first introduced to it, my subsequent tasting made me a firm believer in its excellent quality! 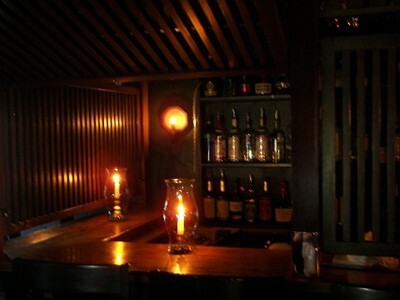 The reluctance of many beer drinkers to consider imbibing in a dark beer is symptomatic of the many stereotypes that exist about beer in general, but none more so than in the case of dark beers. This stereotype of dark beer being too strong or too assertively roasty is shattered by the delicious yet restrained character of schwarzbier. So before you let yourself become intimidated and reach for that light, consider the virtues of darkness. Flip off that switch and allow yourself to take the plunge, you'll be glad you did!